I still can’t believe I finally made it, I quite lost the count of the times I told myself “I have to buy a damn pair of headphones” but I never actually did it. Finally, after my usual one year or so of digging through specialized forums and stuff, 2 weeks ago, I bought my first pair of decent headphones. 2. headphone choice is difficult because there are countless models and because at the end of the story the choice is mostly driven by personal preferences. I mainly listen to electronic music, so I need a decent bass, then, for instance, Grado headphones while being awesome for rock aren’t definitely the best choice for me. 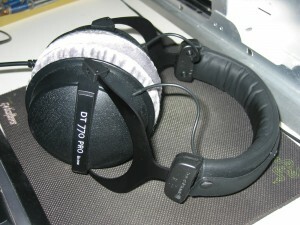 One of the most awarded headphone in the 150⁄200 € price range is the Beyerdynamic DT-770 PRO, they also have very precise and fast bass, so I decided to pick up a pair of these from Amazon, give a it a try and then decide if keep or return them. I don’t consider myself by any means an audiophile, but actually, I can tell you that I loved them since the first minute. They will be used at home, hoked to a Sound Blaster X-FI Xtreme Music (Driver in “Audio creation mode” to have ASIO enabled, no EAX, bit-perfect playback, 44.1 KHz, no CMS3D), Foobar2000 as player and used to listen my FLACs and CDs library. So far I really love them, they are closed and very well isolated, sound doesn’t leak (not that I care that much anyway), bass are really bright and precise; they are also quite comfortable to wear even after 3 or 4 hours. Definitely one of the best thing I ever bought.